Opening up for the 6/16 show at the Starland Ballroom in Sayreville, New Jersey are Bigg Redd and Uni.V.sol. Bigg Redd – My name is Bigg Redd, and I’ve been rhyming since I was 7. My original inspiration was the “Been Around the World” single, which was my very first rap CD. Now my inspiration is my family and the new people I’m reaching at these shows – all the new ears that can hear my music and relate to what I’m going through. I aspire to be nothing less than timeless, both with my music and my name. Uni.V.Sol – I represent New Jersey. I was born into music, so it’s something I’ve always done. My aspiration is to always push my musical limits. I’m inspired by the great musicians who came before me like James Brown, Stevie Wonder, Michael Jackson, Prince, Wu-Tang, Outkast, Fugees, and any artists that have made and continue to make timeless music. BR – This is so dope for me because this is my fourth time opening for Tech, and the second doing it at my home base, so it’s definitely going to be memorable for everybody. Hip-hop definitely needed this tour right now – so the timing couldn’t be more perfect! U – I can honestly say that it feels amazing to be part of hip-hop history. 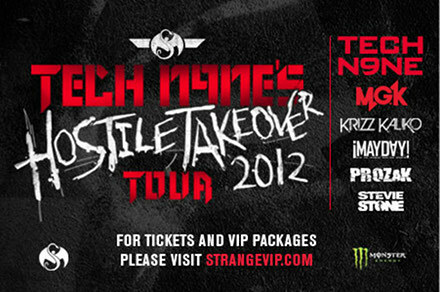 Tech N9ne and Strange Music are setting records and I am proud to be in the mix. BR – I’ve been keeping up with Strange since a little before the MLK tour, which was the first time I had heard of Tech, and since then he’s been my favorite rapper. Kaliko is an inspiration too – I got to speak to him and meet him at the Fire and Ice Tour and I got to ask a few pointers and he was real wit me, so Strange is a huge part of me and what I do. U – For me, this is all brand new. I’ve known who Tech N9ne was for years, and have seen what he’s accomplished, but for me this is only the beginning. BR – They can expect to have a great time and to get in a mosh pit. We always have a great time with the crowd, and it is our home base, so it’s going to be a dope show from start to finish! U – Hard-hitting music and plenty of energy to go with it! BR – Get there early and don’t be cool, everybody move!